The history of the Caffo family business dates back to the end of the nineteenth century, when Giuseppe Caffo, the Master Distiller, class of 1865, began distilling pomace on the side of volcanic Mt. Etna. After years of experience trading and managing distilleries, his dream became reality when in 1915 he bought an old distillery in Santa Venerina, Sicily. He fully dedicated himself to his passion and passed his knowledge along to his children. 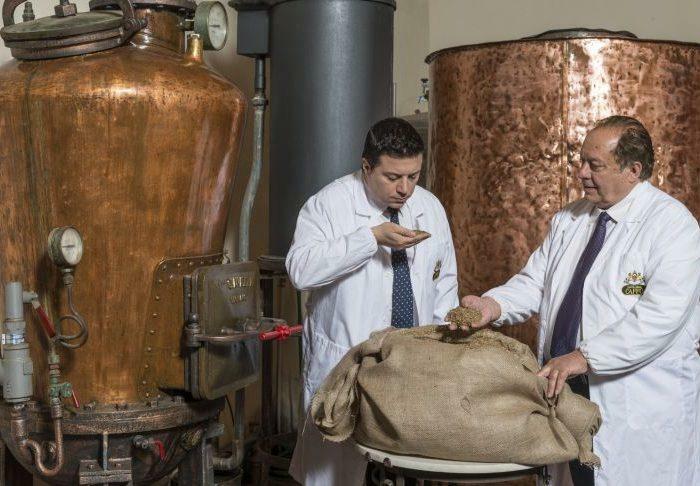 Giuseppe's son, Sebastiano Caffo, soon became a Master Distiller himself, and together they founded the company "Fratelli Caffo" with Sebastiano's brother, Santo Caffo. Initially, Caffo produced a small range of spirits distilled from wine (i.e. grappa), however the Caffo distillery gradually began producing and earning recognition for their fruit and herbal liqueurs and classic Italian spirits such as Amaro, Limincino, Amaretto, Sambuca, and aged Grappa; all of these ancient recipes the result of painstaking research and re-working. After expanding their business the Caffo brothers established a new home in Limbadi, Calabria. In this part of Italy, known for its production of red wine, raw materials and resources for local distilling were abundant.